NEXUS ‘spacious and comfortable interior includes a large salon with formal dining area, entertainment area with large book, DVD and CD libraries and open galley design. Full air conditioning, watermaker, icemaker and satellite phone and email offer all the amenities of home. A spacious covered cockpit features drop-down blinds for privacy and protection, adjustable sun awning, deck shower, and outdoor barbecue. NEXUS offers guests a 6-passenger dinghy with 15hp motor, snorkeling and fishing equipment, towing tube, paddle board, kayak and beach games. Diving on board with TWO diving instructors! Her spacious deck area provides guests on NEXUS ample room for sunbathing on the foredeck trampolines, lounging in the hammock or enjoying cocktail hour with a view in the spacious cockpit. 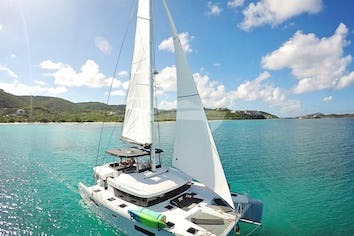 Her custom bow seat provides a spectacular vantage point over the water either under sail or anchored in a secluded cove. Her clean and modern deck layout, dual swim platforms for easy access to the water and waterspouts, and on-deck shower offers guests all they need for an unforgettable yachting experience. 2 Onboard dive instructors - 1 male, 1 female. 3 dives per week per person included, additional dives $25 per dive per person. Capt. Travis discovered his love of the water growing up on the Great Lakes of Michigan. Sailing, fishing, and water skiing were his childhood passions. When those same lakes froze in the wintertime, Travis honed his competive edge playing Ice Hockey and varsity Swimming. When it was time for him to break from his midwestern roots, Travis joined the United States Navy’s Nuclear Engineering Program. While serving for Uncle Sam he soon discovered the awesome undersea world of SCUBA diving. After his service in the Navy, Travis went on to study at the University of Connecticut and bartend his way through college. His outgoing personality combined with his military attention to detail helped him excel in the world of hospitality management. Travis managed and opened a number of restaurants and hotels throughout New England before he decided to investigate the sunny Caribbean. Travis has lived here in the Virgin Islands for over 16 years. During his time here, he has placed a signature cocktail on the menu of the famous Duffy’s Love Shack. Travis has taught sailing and windsurfing to the guests of a major resort. 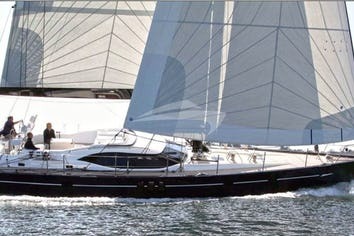 He has captained the performance day sail catamaran Daydreamer around the US and British islands. For years Travis has been a SCUBA instructor and dive boat captain at the island’s best dive shops even distinguishing himself as “The Face of Redhook Diving” on area billboards. Two years ago Travis found his co-captain and best mate, Missy Kom. 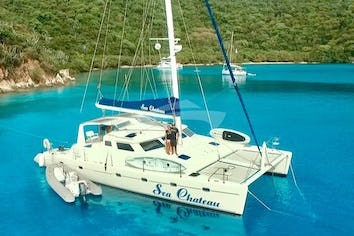 The two of them have been running excellent charter adventures aboard a luxury catamaran. Basically, Living The Dream! Growing up in East Hampton, NY Missy had the honor of working with some incredible Chefs and Entertainers. Among those, Ina Garden, The Barefoot Contessa. This fortunate experience help move her in the direction of creating delicious and elegant food. She also spent several years working at the famous celebrity haunt, Nick & Toni’s restaurant. Another honor to work with many talented James Beard Award winning chefs. In 2007 Missy passed The Court of Masters Sommelier Exam to become a certified Wine Sommelier. Missy loves to explore the wine world by doing weekly wine and cheese pairings with her quests. 6/3/2018 The food was absolutely suburb!!! We could not help ourselves to do anything but eat every incredible morsel laid before us!! 6/13/2018 The week went way too fast, but we will cherish every moment. Thanks for all the fun, food, drinks, dives, snorkel and laughs. 6/5/2018 We loved that you take such good care of Pisces - wishing you many more happy sailings in the future. 5/30/2018 What an amazing week we've had and truly one o the most awesome vacations! 5/30/2018 We have great memories of our time spent with new family on Pisces! 5/27/2018 We enjoyed getting to know you both even better on this trip - you feel like old friends. 5/22/2018 Every once in a while in life travels we meet hindered spirits, as Missy said on our last night, you are family. 1/4/2018 I can't think of any two people I would rather experience it with! 4/22/2017 A true experience of a lifetime! This trip was planned to celebrate Jorge's 40th birthday. It has been an amazing experience. Missy and Travis made everything wonderful. The birthday decorations, the food, the service throughout the whole trip, the anchorages, shore trips, all was spectacular. The accommodations at the Pisces are great, but they made my son's birthday trip an experience we will never forget. Thanks for everything and hope to see you soon! 3/26/2017 The most amazing experience ever!